It’s not often I come across a type of ship in US service I’d never heard of before. 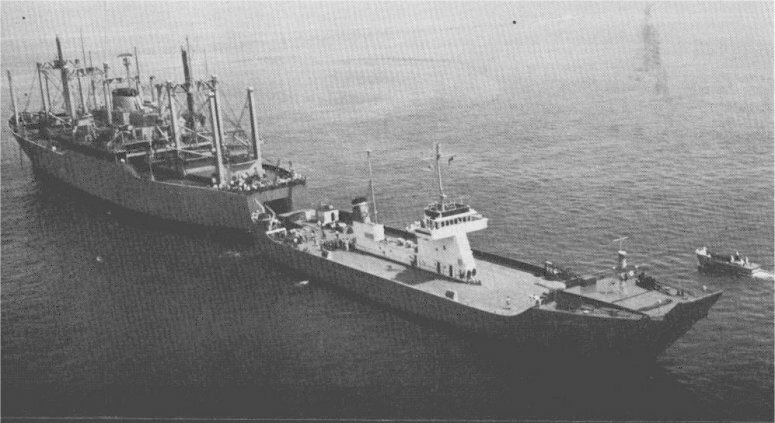 In the mid-1960s, the Roll-On/Roll-Off (RO/RO) type of transport vessel was first designed, the early example being USNS Comet. Trucks and tanks and other vehicles would simply be driven aboard a ship and parked. It was originally seen as a way of reducing the number of times a given cargo would have to be handled. Rather than unloading truckloads of cargo onto a ship and then unloading said cargoes off the ship into a truck at the destination, the reasoning was that loaded trucks could simply be shipped. As a method of moving cargo, it was fairly inefficient The container carrying cargo ship would address that need in a far more efficient manner in just a few years. But it was hardly a failure, as it turned out RO/RO was an excellent way of transporting the vehicles themselves to a theater of war. If the RO/RO could berth in an established port, no problem. Simply lower the ramp to the quayside, and drive the vehicles off. But many theaters, such as Vietnam, had only the most primitive port facilities, and often not even that. Another method of delivering the vehicles from ship to shore would be needed. The Army’s small LCM and LCU beaching craft would simply unable to unload vehicles fast enough. Accordingly, the Army (the lead DoD agency for Over The Shore Logistics) developed the Beach Discharge Lighter. Named the US Army Vessel John U.D. Page, the BDL was 338 feet long and displaced about 2000 tons. 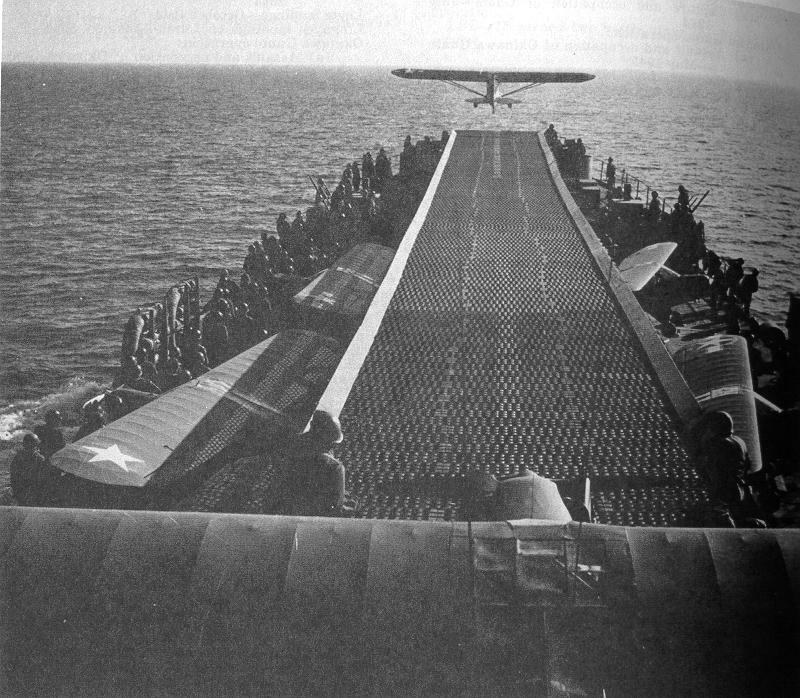 A flat, open vehicle deck supported a thin center island for the ships bridge and stack. A flat open area aft was designed to mate with the stern ramp of USNS Comet. A bow ramp was designed to discharge vehicles over a beach. Cyclodial propellers* gave the BDL excellent maneuverability, and the ability to turn within her own length. The Page entered service in 1958, and self deployed across both the Atlantic and the Pacific. She spent much of the Vietnam war in those waters, facilitating the delivery of cargo both from RO/RO ships and conventional cargo ships to unimproved ports. The Page was the only vessel of the class built, and she served until 1985. In the picture above, you see the page alongside a US Navy LST, and they’re of comparable size. But understand that the BDL was not designed to carry vehicles and cargo on long oceanic voyages, nor was she intended to support an assault landing. She lacked the berthing and messing spaces that an LST provided for vehicle crews, and her open deck, while facilitating rapid loading and unloading, would leave vehicles vulnerable to sea and wind damage on the open ocean. Her open deck, and larger bow ramp, allow her to carry larger vehicles than the LST could, for instance, later main battle tanks such as the M60. * Fairly common now on tugboats and ferries, the CD drive was first tested in the US on a modified LSM. I’ve written a time or two about what versatile ships the Landing Ship Tank was during World War II. How important was the LST? Well, the Navy bought more than twice as many LSTs as it did destroyers. With about 1100 LSTs in service, and a crew of over 100 per ship, that’s about as much manpower as the entire US Navy had in 1939. Virtually all the sailors aboard them were absolutely new to the sea and the service. So training the crews was just as important as building the ships themselves. Cutting edge (for the early 1940s) educational tools were used to quickly train up the crews of neophyte sailors. One of the most common tools was the training film. Here’s the introduction to the LST training films, with a description, and brief discussion of the employment of the ship. It’s about 40 minutes total. URR, I’d love to hear your take on how combat load planning has changed (or stayed the same) in the years since.